What makes stinging nettle so special? 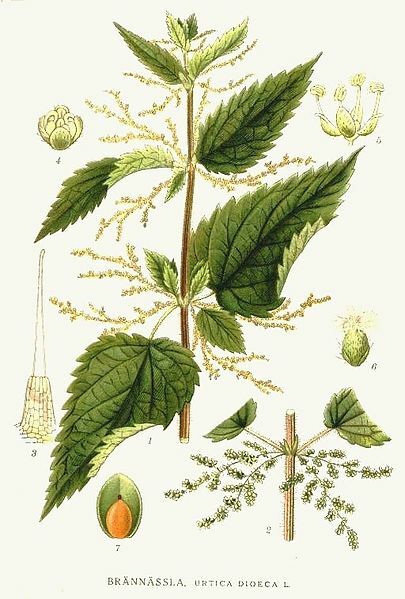 Stinging nettle is a versatile and inexpensive food item. It can be used to make teas, soups, stews and salads. According to data culled from the US Forest Service (fs.fed.us), “Stinging nettle produces abundant seed. Plants growing in the shade produce approximately 500 to 5,000 seeds per shoot and plants growing in full sunlight produce 10,000 to 20,000 seeds per shoot.” So, it should come as no surprise to those interested in growing their own plants that, literally, thousands of stinging nettle seeds can be purchased online for less than $50. Stinging nettle is rich in potassium—a mineral found in foods such as bananas, potatoes, white beans, greens, avocados and certain fish—which helps regulate blood pressure and improves overall heart function as well as maintaining fluid and electrolyte balance. Additionally, multiple studies have shown that stinging nettle can help improve an individual’s quality of life. Currently, the FDA suggests individuals 14 years of age and older should consume 4,700 mg of potassium each day. Pregnant women are advised to consume 5,100 mg of potassium per day whereas the requirements for people under the age of 13 are anywhere from 3000-4500 mg based on their exact age. When a person does not receive enough potassium he or she can develop hypertension, which puts those individuals at risk of suffering a stroke or heart attack. Conversely, as of the date of this article, too much potassium—amounts that far exceeds 5,100 mg per day—can be fatal. Can stinging nettle replace prescriptions and over-the-counter supplements? There is no concrete answer to that question because what works for one person may not work for another person; additionally, radical dietary changes are never advisable without consulting a health care specialist first, and this is especially true for individuals using prescription drugs. Upon consulting his or her primary physician, a person may find that he or she can safely add stinging nettle to his or her diet and, possibly, use it in conjunction with synthetic medication. For example, two of the stinging nettle plant’s dietary perks are its calorie and potassium content. One cup of cooked stinging nettles has less than 50 calories, almost 300 mg of potassium and less than 4 mg of sodium. This is just one reason why health conscious individuals and naturopathic doctors advocate the use of stinging nettle for its many nutritional and medicinal benefits. How exactly can stinging nettle help control hypertension? Various studies have shown that the stinging nettle plant’s leaves and roots have beneficial diuretic and anti-inflammatory properties. These agents act as a blood thinner and they also helping the body fight water retention. Blood that is less likely to clot reduces a person’s chances of having a stroke or heart attack due to arterial blockage that typically occurs in people living with hypertension. Is stinging nettle completely safe? Contrary to popular belief, words like “all natural” and “alternative” do not necessarily mean products bearing such labels are safer than synthetic drugs. Even with all of its professed benefits, stinging nettle can cause a number of serious side effects. For example, pregnant and breast-feeding women, people with known kidney and heart health issues, diabetics and individuals with certain allergies or respiratory conditions may not be able to tolerate stinging nettle. The plant can also be counterproductive for people using prescribed sedatives, blood thinners, etc. There have been reports of spontaneous abortions happening to pregnant women due to agents in stinging nettle that cause uterine contractions. Individuals with compromised renal systems may find themselves urinating more than normal, which may put undue stress on their kidneys. Some diabetics have experienced significant drops in blood glucose levels, which can be dangerous. Similarly, some people living with hypertension may experience dangerous drops in blood pressure when using stinging nettle. These are just a few reasons why it is imperative that individuals interested in adding stinging nettle to their diets consult their respective health care providers first.